When you greet visitors with relevant content at the point when they're most likely to engage, you can increase content consumption, encourage self-nurturing and accelerate their buyer journey. Today we’re excited to announce a new feature that will allow you to serve up content recommendations on any page of your website and leverage the power of AI to personalize content experiences at scale. Uberflip Site Engager has arrived. Site Engager automatically pulls from existing content in your Uberflip Hub and displays it on your website in the form of content recommendations. It also communicates directly with Uberflip AI, to dynamically personalize at scale. Site Engager is a turnkey solution for incorporating dynamic content recommendations into your website. It can be installed in seconds by embedding a simple code snippet in your site. You then have the freedom to manage everything right from within the Uberflip platform. Once the tool is installed, you can quickly start leveraging existing content items in your Uberflip Hub and display them on any webpage, in the form of engaging content recommendations. This promo tile will feature the most relevant item among the potential recommended pieces and display it in the bottom left or right corner of the visitor’s screen. As a visitor starts to move their cursor towards the dreaded “Back” or “X” buttons on their browser tab—actions that signal they are about to bounce from your site—we’ll display a piece of content to help re-engage them. When a visitor clicks on one of these tiles they will be able to start consuming that content right from the page they’re currently viewing. This experience also supports multiple content items, encouraging them to consume more content and self-nurture at an accelerated pace. You can even cap the end of your recommendations with a lead capturing Form CTA. Site Engager communicates directly with Uberflip AI, allowing you to automatically serve up personalized content recommendations based on a visitor’s intent. What do we mean by intent? By leveraging Bombora’s visitor intent data, Uberflip AI can know if your visitor has been browsing content related to topic "X" on other websites. You can then leverage Uberflip AI in your recommendation rules to find the most relevant content on that topic from your Hub and serve it up as a recommendation. This content is more likely to get engagement since it’s tailored to the interests of the visitor. Ready to start engaging your website visitors with personalized content recommendations? Let's get started! Jason is the Product Marketing Manager at Uberflip. He loves sharing product news, updates, feature releases, and customer stories. See how your sales team is leveraging content and prove the value of your sales enablement efforts. Ready to Take Your Content Experience to the Next Level? Yes, add me to the Uberflip email list! By checking this box, you provide us consent to email you educational content, and information on our products and services. You may unsubscribe at any time. The Recommendation Dashboard provides the insights and data you need to optimize content recommendations and measure their impact on conversions. 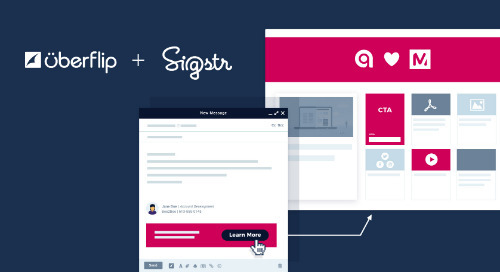 Uberflip and Sigstr have teamed up to provides companies with a brand new content distribution channel that personalizes the destination based on the specific email recipient. Get ready for Flipbook quality like you’ve never seen before. We’ve upgraded Flipbooks to deliver content in SVG format! You now have the freedom to fully optimize your content experiences with contextual calls-to-action. Oh, the possibilities! In this blog article, we investigate content management for audiences with data science to see why content tagging and integrations matter. Learn how to create a customer-centric, regularly updated, well-structured, and easily accessible knowledge base that will make your customers love you. Scaling ABM isn’t easy, but Uberflip's account-based marketing features can help you better leverage content to reach your target accounts.